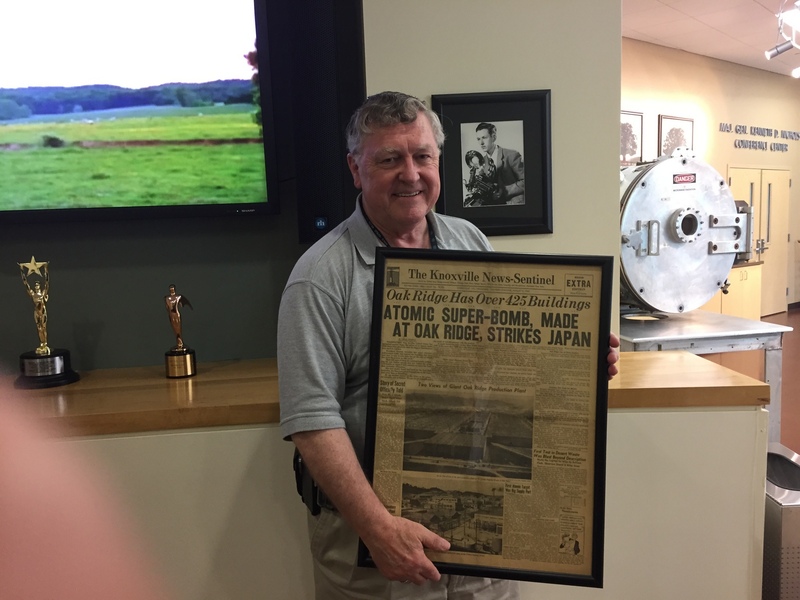 Y-12 Historian Ray Smith holds a copy of the Aug. 6, 1945 newspaper, which revealed the Oak Ridge work in developing the first atomic bomb. Toward the end of June 1945, Y-12 received orders to clean out the machines known as calutrons, scrape together every last bit of enriched uranium and deliver it to the bomb-makers at Los Alamos, N.M.
For those who had any real knowledge of what was going on — and that was maybe only 100 out of the 22,000 people who worked at the wartime plant in Oak Ridge — it was a signal that something big was about to happen. The war against Japan was furiously engaged, and the United States was about to reveal a weapons capability heretofore unseen and barely imagined. The atomic bomb dropped on Hiroshima, Japan, Aug. 6, 1945 was fueled by the fissionable uranium-235 painstakingly separated by the Oak Ridge calutrons. It took years of extraordinary engineering, a large and dedicated workforce, and round-the-clock operations at Y-12 to produce a relatively small amount of enriched uranium — about 60 kilograms or 140 pounds. Most of that uranium supply was reportedly used in the “Little Boy” bomb dropped on Hiroshima. The Oak Ridge uranium mission was so new that research and production were often one and the same, especially in the early days of the Manhattan Project, and it all took place amid mind-controlling secrecy. The calutrons at Y-12 were a variation of a mass spectrometer developed by E.O. Lawrence at the University of California, who won the Nobel Prize in physics in 1939 for his invention of a similar device known as a cyclotron. The electromagnetic system separated the isotopes of uranium by mass, allowing the fissionable U-235 — which occupies less than 1 percent of uranium in nature — to be isolated from the dominant U-238 isotopes and collected. The initial Alpha calutrons were not as productive as the Beta machines, which were capable of a much higher enrichment (the percentage of U-235). Therefore, the product from the Alpha machines was used as feedstock for the Betas, with the non-stop separations ultimately providing uranium that was rich enough in U-235 to be weapons useful. The uranium used in the Little Boy bomb reportedly had an enrichment of about 80 percent. In the early part of 1945, the mile-long, U-shaped K-25 plant came online a few miles away from Y-12 and used another technology — gaseous diffusion — to enrich uranium. According to Smith, the uranium from K-25 wasn’t of weapons grade at that time, but its enrichment was high enough that it took over the role of the Alpha calutrons. The K-25 product was fed directly into the Beta calutrons at Y-12 to bolster the output of highly enriched uranium. Without the contribution of K-25 from March to July 1945, there might not have been enough uranium available for the Little Boy bomb by the time it was used. Production activities at Y-12 began in the middle of 1943, and Smith said the first shipment of uranium to Los Alamos — about 200 grams and only 12 percent enrichment — took place in March of 1944. Those lab quantities of early product were important for bomb planning and preparation. The precious uranium, which was placed in a coffee cup-sized metal container lined with gold, didn’t go directly from Oak Ridge to Los Alamos. For security reasons, two military couriers reportedly dressed as salesmen boarded a train for Chicago. When they got to Chicago, the briefcase containing the uranium was handed over to two military couriers from Los Alamos. “So the people from Los Alamos didn’t know where it came from, and the people in Oak Ridge didn’t know where it went — except that they were taking it to Chicago,” Smith said. Gen. Leslie Groves, who directed the top-secret Manhattan Project, was big on compartmentalization for security purposes. “He didn’t want anyone in one department to know what the other department was doing,” Smith said. Hundreds of buildings were constructed at Y-12, including the nine huge buildings that housed the calutrons. The sprawling comlex took up much of Bear Creek Valley, and the buildings were numbered in a way that revealed their purpose. For instance, all buildings that began with 9723 were changehouses for workers, and all warehouses began with 9720, such as 9720-5 which for many years housed the plant’s main stockpile of highly enriched uranium. Any building with a number starting with 92 was used for uranium processing during the war years. It’s no coincidence that 92 is the atomic number for uranium. Smith said he’s often wondered what Groves — with his penchant for high security — thought of this not-so-obscure reference to uranium at a top-secret plant. “Don’t you know Groves would have been frustrated when he found out what these people in Tennessee were doing?” he said. The one exception to the uranium designation was Y-12’s very first building — 9731 — the pilot facility that housed two Alpha calutrons and two Beta calutrons for testing during the war. Smith said legend has it that the Pilot Plant’s number was selected based on the building’s elevation above sea level. He said he tested that story by using a GPS and — sure enough — the bottom floor of 9731 registered an elevation of 973.1 feet. Unlike other operations at Y-12, the Pilot Plant was occupied by Lawrence’s staff from the Berkeley Radiation Laboratory in California. They were constantly adjusting the calutrons to make them more efficient and productive. There’s an anecdote about Lawrence who, during one of his visits to the East Tennessee war plant, walked through one of the calutron buildings and asked supervisors, “Is that the best you can do?” The Nobel Laureate supposedly adjusted some of the dials and knobs, ratcheting up the voltage to increase production. According to the tale, Lawrence’s on-the-spot tinkering worked — at least temporarily — but soon after he left the building, electrical sparks started flying from the machine and operations came to a brief halt while the system was returned to its previous settings. Because of ultra-security measures in place during the Manhattan Project, most of the Y-12 workforce did not know the nature of their work or how it would be used. But they were made acutely aware that their work was important to the war effort. Even on Aug. 6, 1945, after the first atomic bomb was dropped on Japan and the U.S. government announced the nature of the bomb project — and provided details of Oak Ridge’s deep involvement — many Y-12 workers actually learned details of their work from published news accounts. The late Bill Wilcox, a chemist who prepared the first uranium lot for shipment to Los Alamos and later served as Oak Ridge historian, often told a story about a Y-12 colleague who learned of the news that day in a telephone call from his wife. Finally, after years of intense secrecy and wartime pressure, he could say that word. This entry was posted in History, nuclear, Oak Ridge things, Y-12 on August 5, 2015 by Frank Munger.